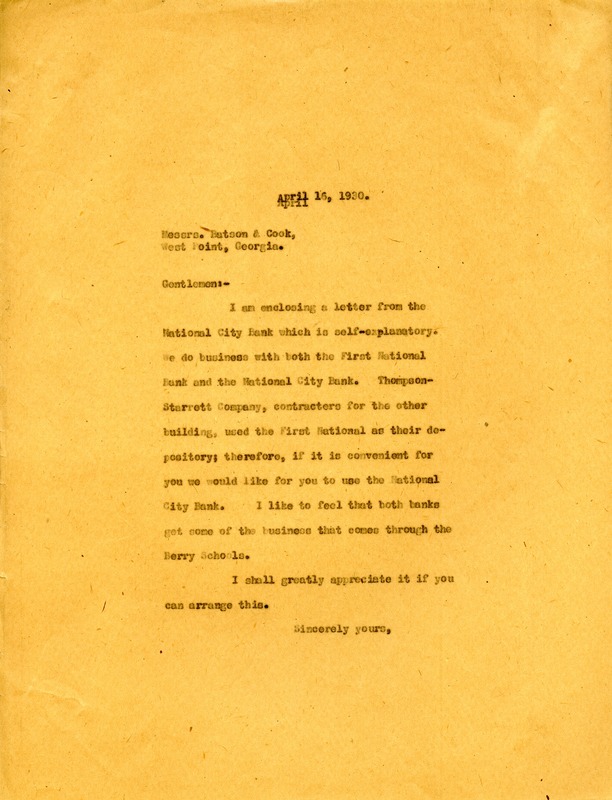 A letter from Martha Berry to contractors Messrs. Batson & Cook instructing them to use the National City Bank since the other contractors, Thompson-Starrett Company used the First National Bank as their depository. The Berry Schools do business with both banks. Miss Martha Berry, “Letter to Messrs. Batson & Cook from Martha Berry.” Martha Berry Digital Archive. Eds. Schlitz, Stephanie A., Meg Ratliff, Catherine Folnovic, et al. Mount Berry: Berry College, 2013. accessed April 25, 2019, https://mbda.berry.edu/items/show/12170.